Proceedings began with a bang at Dundalk as George Cornelius put himself in the Royal Ascot picture with an impressive success on debut in the Irish Stallion Farms EBF Median Auction Maiden. Danny Murphy joined winning trainer Kieran Cotter’s team last September, bringing an influx of owners and horses. The quality of Cotter’s string has improved as a result and Murphy has vast experience having been a leading trainer in Macau and also plied his trade in the likes of Singapore and Malaysia. George Cornelius (14-1) took the eye under Mark Gallagher with the manner of his win – going four lengths clear before halfway and staying on strongly inside the final furlong to triumph by 10 lengths. “He’s for a new owner and he has three or four in the yard and this is his first runner,” said Cotter. “He was doing his best to get over here today, but family matters kept him away. I’m sure they are all looking at it on TV and delighted with that performance. “We had a few pounds on him and it’s been a great day for us. “We have 10 two-year-olds and four or five that are well forward. We have a few new owners in the yard that bought quality stock with Danny Murphy racing. “It has upped the level in our yard and it’s great to be able to come and compete. 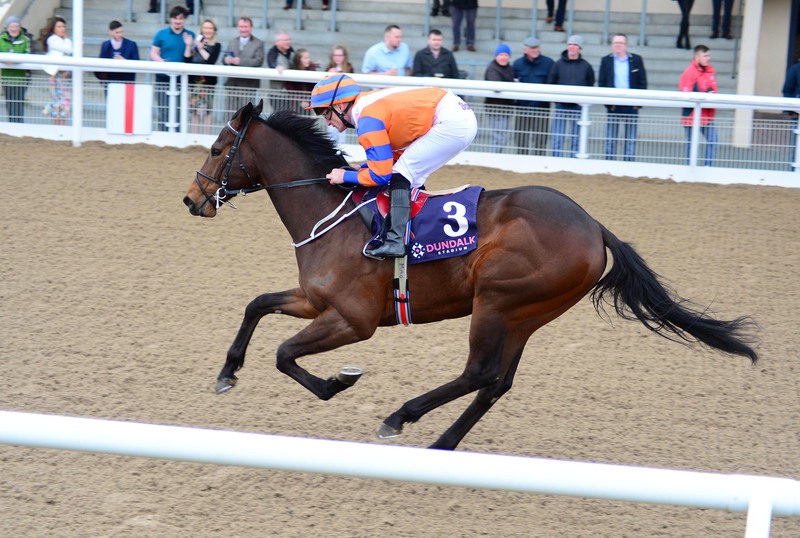 Aidan O’Brien and his son Donnacha were in double form as they struck with Empire State (4-6) in the Irish Stallion Farms EBF Maiden and Ferretti (2-5) in the Imperial Hotel Dundalk Maiden. Michael Halford and Ronan Whelan hit the target with Miss Snossyboots (5-4favourite) in the Recruit Island Handicap. Halford said: “She’s very genuine. It’s hard work out there today, facing into the headwind and the surface is quite slow. Halford has care of Miss Snossyboots for owner/breeder and HRI chairman Nicky Hartery and regarding the surface at Dundalk, he added: “It’s riding very slow today. Whelan then rounded off his 17-1 brace aboard Lyrical Attraction for Jarlath Fahey in the Racing Post Handicap.